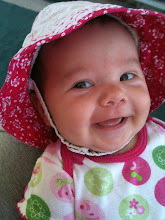 Here's the baby girl, growing so fast & continuing to be the sweet baby we all can't get enough of! For all the smiles we get everyday she just wasn't quite it the mood, plus when a camera is in her face she's more curious about it then "posing" like I think she should. She's still proving to be a very easy going girl. She eats, smiles, giggles, gurgles trying to talk, hangs out, then sleeps. It's a rare occasion that she gets overly upset & it's usually a pretty good reason if she does, so even though I'm still getting up with her once or occasionally twice at night I don't mind too much. Finally a smile, but not looking up. The best we got that day, such a sweetheart! This is the face & eyes I get to stare at each day & the loving girl that looks at me like I'm the best thing around. I don't know that I feel like I rushed around being the mom of my first two necessarily, but I really am enjoying Rachel & feel so content being with her & slowing down a bit. I realize how quickly the "baby" time goes & while all the growing stages are fun, I'm enjoying the baby cuddles while I can get them! Can't believe you only have to get up once or twice! That's awesome.